· The main brackets are pre-defined and cannot be changed. · Special brackets are brackets which are completely treated as external tags (e.g. comment tags "<!-- --!>"). To add items, enter a tag name in the text box below the list and click the button Add. To remove items, select one item in the list and click the button Remove. In the frame Special external tags, you can define tags which need special treatment in that not only the tag but also their content is treated as external tag which should not be translated. To add items, enter a tag name in the text box below the list and click the Add button. To remove items, select one item in the list and click the Remove button. In the Internal tags frame, all tags which are to be treated as internal tags are defined. To add items, enter a tag name in the text box below the list and click the Add button. To remove items, select one item in the list and click the Remove button. In the Attributes to be translated frame, all attributes that need to be translated are defined. To add items, enter a tag name in the text box below the list and click the Add button. To remove items, select one item in the list and click the Remove button. · Activate Optimize external tags, when internal tags which have external tags as neighbors should be treated as external tags, except if the tag has a closing tag which cannot be treated as an external tag (recommended). · Activate Optimize aggressively, when all internal tags which have external tags as neighbors should be treated as external tags (disregarding any closing tags) (recommended only in special circumstances). · Activate Remove paragraph breaks to remove paragraph breaks. This is important when the document contains many page breaks resulting in inconvenient segmentation of the text. To restrict this feature to "<p>" tags, check Only in <p> tags. · Activate Delete SPAN tags if the SPAN tags should be deleted. Recommended only if the SPAN tags do not contain important information. · If the HTML code includes a META tag with information about the character set to be used, it is displayed. You can change this character set and view the result by clicking on the Preview button which launches the Internet Explorer to view the current document. · You should also define the character set of the target document to make sure that the translated document will be displayed properly on all systems. 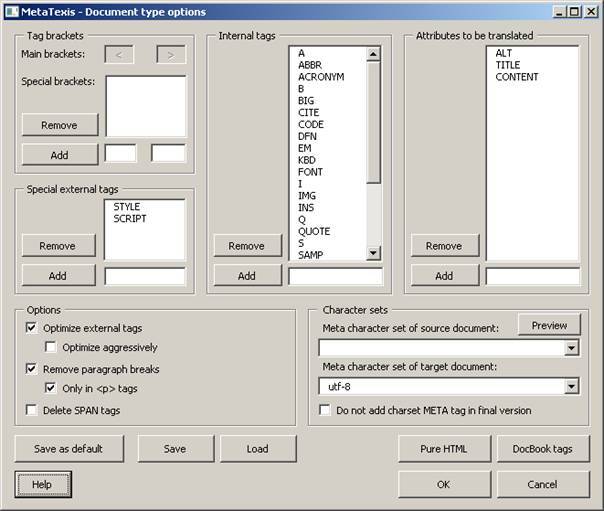 When the final version is produced, the translated text segments will be treated according to this setting. By default, the character set "utf-8" is set to make sure that the page can be displayed on all systems worldwide. · To set the current settings as default settings, click the Save as default button. · To save the current settings, click the Save button and define a name in the dialog displayed. · To load settings, click the Load button and select a setting. · To load the settings for pure HTML, click the Pure HTML button. · To load the settings for the DocBook format, click the DocBook tags button.